Now that Mercury’s out of retrograde, you can rest assured that your life will get back to normal (or, at least, back to relative normality). But will your driving improve? Since Insurify is all about car insurance savings and real-time quote comparison, the team thought it was only fair to figure out if the stars and planets had any bearing on driver behavior. As we all know, poor driving and other elements of your profile (your age! Your gender! Where you live!) can be major forces behind high car insurance rates. And yes, some of those very same factors might be present in your birth chart, too. So, how do the signs stack up when they hit the road? Time for the zodiaction to kick into high gear. 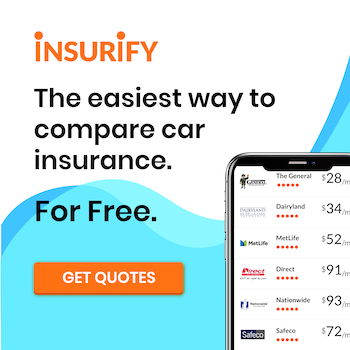 The team at Insurify, an auto insurance quotes comparison site, collected automotive and demographic data from its database of over 1.6 million car insurance applications. Applicants provide driver history, vehicle type, location, and other personal information related to their insurance risk profile to get the most up-to-date, real-time car insurance quotes. Insurify’s team analyzed driver behavior across four key driving-record metrics (speeding tickets, accidents, DUIs, and suspended licenses; all within the past seven years) by each astrological sign, which corresponds with one’s date of birth. Also included are rankings based on proportions of luxury vehicle ownership, truck ownership, and astrological sign prevalence per city, all based on Insurify’s user data. In a move surprising absolutely nobody, Aries ranks #1 overall for dangerous driving behavior. Good thing we’re firmly in Aries season as of this writing. Aries are often stereotyped as being steadfast supporters of others, with a zest for life that verges on grating. They’re also supposed to be super impulsive. So it’s no surprise that Aries wins two of our dangerous driving superlatives: Most Likely to Get a Speeding Ticket and Most Likely to Have an Accident on their Record. Great job with the reckless driving, Aries! Haha, NOT! Aries is also top-ranked for luxury vehicle ownership. High rates of accidents plus a taste for the finer things in life. What could go wrong? Taurus is, above all things, a provider. In this case, they’re providing us with a reason to laugh at them for being the third worst drivers in the country. Taurus values security, pleasure, and getting the job done above all else. Taurus really got the job done when it came to racking up those license suspensions. Taurus is often characterized as the noble bull. That’s bull. Gemini—the twins—is a curious sign that often faces a lot of clichés. But don’t believe everything that you read: is Gemini two-faced? No. Is Gemini endowed with a dualistic spirit that helps them to see both sides of any situation? Also no. Does Gemini have the mentality of a child? Absolutely. Gemini ranks above average in terms of driving success, but it takes two to tango, and apparently to get into a car accident, too. Gemini ranks third overall for fender-benders. That’s what you get for letting two people control the wheel. The nurturer, the romantic, the completely bonkers: admit it, you’ve fallen for a Cancer at some point in your life. Too bad they’re absolute garbage at operating a motor vehicle. Cancer must have had a really crabby streak in the past seven years, because driving records indicate that Cancers have the most suspended licenses of all the signs. There’s a number of reasons why this could be—many different offenses could warrant license suspension. But we’re just going to go ahead and assume it has something to do with Cancer’s trademark emotionality. Deep breaths, Cancer. Deep. Breaths. They’re often seen as regal rulers, drama queens, and thorough narcissists. They’re the stars of their own lives. They’re spoiled brats; they’re mansplainers; they probably yell at baristas. And as if Leos needed yet another reason to brag about their stupid, perfect little lives, they rank dead last in our analysis across all metrics of undesirable driving behavior. So good for you, Leo. We can’t stay mad at you, because you’re kind of an okay driver. Here’s a blue ribbon. For your LUXURY car. Sometimes, Virgo’s reliance on expediency and precision can backfire. They’re a little too reckless on the roads, and aren’t the best out of talking themselves out of a ticket. Thus explains their #2 rank when it comes to speeding citations. Virgo does not spark joy. Next. Balance, justice, fairness, equity: all values associated with Libra, more commonly known as the most boring sign in the entire zodiac. Some think that Libra’s obsession with equilibrium manifests as indecisiveness and flakiness. That’s not true. It manifests as being incredibly boring. Libras eat plain Greek yogurt. I say again: Libras are boring. A true “middle-of-the-road” driver, Libra is neither an insurance company’s dream nor its nightmare. According to this analysis, they’ve really struck a balance between at-fault incidents and a spotless driving record. If you were to ask anyone with at least a tangential knowledge of astrology which sign was overrepresented among drivers with a DUI from the past seven years, they’d probably say Scorpio. Sorry. Scorpio—the consummate party animal, venomous predator, and tough-love dispenser—almost never takes the high road, but when they do, they’re probably going to get pulled over and made to do a sobriety test. Come to think of it, they do that on the low road, too. Though their overall Danger Rank is not too bad, to know a Scorpio is to know how it feels to get stung. That’s dangerous in and of itself. Sagittarians are most commonly found whitewater rafting, penning the next Great American Novel, or inviting you to their fifth social justice-themed improv show downtown. Though they’re not accident-prone, they rank pretty high for speeding and license suspension. Sagittarius loves to embrace the impossible, which is pretty admirable. You know what’s totally possible, though? Following the speed limit. Get it together, Sags. Capricorns are perfect. They value structure and live with purpose. They’re loyal to a fault. They employ a methodical approach to problem-solving, are intensely loyal to their loved ones, and are known to have a profound and even mystical interior life. It is with a heavy heart that this writer admits that Capricorn was the most likely to have a DUI from the past seven years on their record—helping them catapult to an overall Danger Rank of #2. It can’t be explained rationally (much to the chagrin of the Capricorn), so it only makes sense that this ranking is attributed to the fact that Capricorn, the sea-goat, is caught between two worlds: that of land and that of water. Stuck in a perpetual limbo, Capricorn can’t seem to master control of the terraneous vehicle. Maybe they should try boats. Aquarius, the water-bearer, ranks pretty low on this list when it comes to dangerous driving behaviors. Could this be because they’re often seen as emotionless, detached drones, with the overall driving abilities of a self-driving vehicle? Perhaps. I mean, have you ever tried to hold a conversation with an Aquarius? It’s like talking to someone who’s forever on autopilot. Pisces are unfairly stereotyped for being kind of fishy…and drinking like a fish, too. DUIs are their most common offense according to this analysis, so do with that what you will. They’re tied with Aquarius overall when it comes to dangerous driving, but that doesn’t mean things always go swimmingly for them. Deeply creative and flighty, Pisces will often find themselves unable to function in real life. The world is not your canvas, Pisces! So, is this a groundbreaking study, or have you just been totally April Fooled? Well, that depends on if you believe in the stars. The data presented here is real. Keep in mind that Mercury is the planet that rules intellect, communication, and how we take in information. Do with that what you will. It did just come out of retrograde, after all…. 2019 KICK AM 1530, Townsquare Media, Inc. All rights reserved.